English 20th-century brown pigskin by the Hampstead bindery; lettered: Horae Beatae Mariae Virginis. Eleonore de Bourbon, comtesse de la Marche (arms at foot of crucifixion on fol. 79, Armagnac quartered with La Marche); Jacques Teilhard, rector at Tirargues (1700); Sotheby's sale (London, Dec. 1, 1896, no. 547) to Karslake; purchased by J. Pierpont Morgan (1837-1913) from Pearson before 1913; J.P. Morgan (1867-1943). 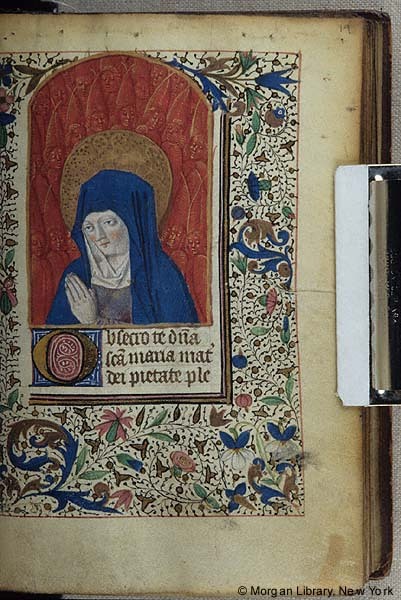 Ms. book of hours for the use of Rome (Hours of the Virgin? ); written and illuminated in central France, ca. 1470.